​I AM Life when I am Consciously Aware and Awake. Blessings unto the heart and mind of your beings. I am Lady Master Natasha. 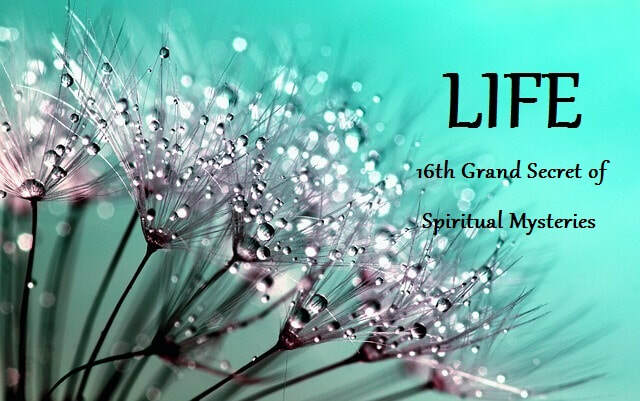 Beloved Ones, we greet you this evening, The Council of 8, with the 16th Grand Secret of Spiritual Mysteries, that which is called Life. You would think, as it were, that you, as Spirit in human form, living life, would understand all there is to know about it. And that to have teachings, or sessions or interactions regarding life itself, that you have been living since you were born would be redundant, so to speak. We trust that as this secret completes all of its pearls you will have a different perspective, as it were. We begin this evening with interaction. To begin with, it is always important that one understands the meaning, yes, of the words that one is using. And in this case, the meaning of Life is very large and it has many definitions. But before we define it, we wish to hear what metaphors and what similes, as it were, you have heard about life or that you believe about life. Either or both. For instance, life is a burden, or you may say something like, life is like perpetual sunshine. So we are asking what you think life is or what you have heard life is or what you think programing may exist on this planet that life is, as well as, using the word like. What it can be compared to. Student 1: Life is a miracle. LMN: Life is a miracle. Indeed. Student 2: I’ve always heard-Life is what we make of it. LMN: Indeed, life is what you make of it. Student 3: Life is a journey. LMN: It is a journey. Yes. Student 4: I think life is god. Student 4: Yes. The atoms and molecules and everything that makes up life. LMN: So the terminology that is not the god on the throne, but god that is the essence of all things. That life is composed of the essence of all that is. Yes? Indeed. So, that is four suggestions from consciousness about how life is perceived. Now we wish to add further. We wish to suggest that life is that which is conscious of itself. Not that which simply exists. Not that which is called one dimensional or two dimensional or three or four. Nothing to do with dimensions. And everything to do with consciousness. For life itself begats itself. And it is only through consciousness that one can recognize that one has created. So in the suggestion that life is consciousness, that means that you are aware that you exist. It does not, however, mean that you are aware that you are minuscule (or miniscule). Or that you are aware that you are programmed. Or that you are aware that you live in a paradigm. Simply that you are aware that you exist. So with this definition, one might say, there are certain plants on your planet that are non-edible that are aware they exist as a plant. Animals are aware they exist as an animal. Not by the name that you would call them. A bird does not think of itself as a bird, but it is aware of its existence. A dog does not think of itself as a dog, but it is aware of its existence. Now the level of this awareness of a plant, of a fish, of a creature that is non-human does not mean there is necessarily the consciousness of conscious awareness. And this is what we speak of when we speak of life. Conscious awareness. So life, Beloveds, in this discussion is about conscious awareness. For when you move through life without awareness, you are life, you are conscious that you exist, but you are not as it were, alive in the consciousness that We, the Council of 8, have been helping you to recognize is your birthright. There is awareness and there is awareness, yes? So there is the automaton, the automatic existence of consciousness of life, and then there is the awareness of life from the perspective that you are the liver of that life. You are the heart of that life. You are the brain of that life, and you are the direction of that life. And direction is what we speak of this evening, in this first lesson of the 16th Grand Secret of Spiritual Mysteries, Life. We speak of direction. What control do you have over your life? And how do you know within your life and the living of your life that you are making decisions that are wise decisions? How do you know when you are living that which comes from the heart of your being and the wisdom of your being? Or you are living that which is simply all of the repetition that you have lived over and over and over again? On your planet now, in this moment, as we speak, in this month you call November, in this year you call 2018, there is a great deal of panic in the consciousnesses of your planet. Panic because the majority of those on your planet feel they are being guided and directed and forced to live lives that are not of their making. That are not of their choice. And in this panic they are desperately seeking choice. Where do I go? How do I live? What choices do I make? The reason there is panic, Beloveds, is not what you might assume. It is not because of what the news says. It is not because of what political leaders say. It is not because of dangers potentially looming. It is because there is repetitive memory within all of humanity in this moment. Repetitive memory of what has come before when life has reached this crescendo of panic. And that is what is increasing. The panic on your planet. Life has a memory and it remembers repetition. And in the repetition it feels powerless. It feels unable to make a difference. And thus it is that this evening there were those who shared with you their perspectives on how you as a collective might make a difference on the planet. On planet earth there is one major repetition that has occurred over and over again and that is destruction of not just the planet herself but the life forms that are on the planet. Not just extinction but eventually destruction. And so when you reach that point in consciousness on your planet where something triggers, as it were, this memory of former destructions of which you participated---not that we are saying you were creators but that you were in conscious awareness during the experience---the fears surface. The panic surfaces. The remembrance of A leads to B leads to goodby, as it were. We bring this to your attention not to say that this is hopeless and we will catch you on the next go round, as it were. We bring this to your attention because this is why you are here. This is why you have incarnated. This is why you are working with planet Earth. Not because you have lived endlessly repetitions of destruction but because you have lived repetitively desires to assist earth in halting the pattern of destruction. And to this end, Beloveds, you have been studying lessons with the Council of 8. You have been listening and learning. You have been renewing and reviewing yourself. You have been letting go of that which all along you have assumed were your programmings, were your issues, were the things that you did in other lifetimes. And we say unto the hearts and the minds of your beings in this moment, that you allowed yourselves to take on these ideas so that you, to be of assistance to the planet and to earth and humanity might collectively and individually, continually reduce the fear, the worry, the anxiety, the anger, the jealousy, the resentment, the negativity that created so many mass destructions of this planet. So during this time when you have been wondering if you would ever wake up, you have been clearing, as it were, those frequencies and energies and thought forms and feelings that have been running rampant on planet earth for so long. You have come as a "cleanup crew", as it were, but with great wisdom and understanding and compassion and daring, as it were. For always there was the knowing that you might be stuck, as it were, in the mass morass of negativity. But you are each rising to your personal heights. You are rising to the place within yourself where you are realizing you are not the collective illusion that is external to your being, and as you recognize this, you are separating yourself from that influence. And as you separate yourself from that influence, not only do you become more centered in your own being, you become more aware. You will still be doing your "clearings", as it were, and sometimes you will still be feeling as though it is you and not something external to your being but it does not matter, just as it does not matter what is the name of an entity, a guide, that comes to assist you. It does not matter the name. It matters if they are of the light. It matters the fruits their presence brings. And that is what matters about your presence here---the fruit that you bring. And each of you can say you are not who you were years and years and years ago. Each of you can say that you have moved through and passed and beyond so much that you thought was limiting in your reality. That was powerlessness and hopelessness in your reality. You have moved beyond this. For each of you hearing these words is able to know within yourself you have a strength and a confidence that has reminded you who you are and why you are here and what you can do about it. Now you are looking to work collectively as a group. Indeed, Beloveds, you remember, unless you ask, those who are not of your planet cannot assist you. For you are a free will planet. And we cannot usurp your free will. But the moment you open the door we are there with energy, with suggestions, with help, with assistance. We are there to help you, not only to keep yourself free, as it were, from the limitations that the illusions of life cast upon your experience of it. We are also there to help you re-remember your strength, your purpose and to lend energy and support and to be a participant, as it were. So when you are counting your 13, as it were, The Council of 8 is indeed one of those 13. And if you are asking, we are granting our permission as well, and our support as well, to engage in that which you would determine is the direction you wish to take. Now how does one know at this moment in time? How does one separate oneself from the fears of the collective consciousness to one’s own inner truth? There are many ways and you have been learning them over the years. But we will reiterate this. One finds the place where one can be within oneself. Whether it is a few moments. Whether it is a long time. One finds a place where one can connect with the inner wisdom of the self. One finds a place where one can visualize. Where one can decree. Where one can tune in. Where one can listen. Where one can separate oneself from the energy of the masses, as it were. Unless the masses are in collective group energy with a direction that you have determined. It is that simple. It is the remembrance within that that is where the power is. And even if the outer world says to you such and such is going to happen, why would you believe it? Why would you own it if it is against your truth? And this is where you must take your personal stand. It is not about looking at the outer world and believing in a war. It is not looking at the outer world and believing in the leadership of countries. It is about owning consciousness. And it is about holding a truth within yourself that consciousness is what you are seeking in leadership. And that consciousness is what you are seeking in friendship. And that consciousness is what you are seeking in collective energy work. Consciousness. Awareness. Conscious awareness that you are. The battery, as it were, that lends the project with energy to complete itself. That is the introduction to Life, Beloved Ones. Namaste unto the heart and the mind and the souls of the spark of your beings and the collective consciousness that you are. For as you collect yourselves as a consciousness that is aware and you interact with one another in this awareness you take away power from those who are not awake and not aware. Namaste unto the heart and the mind and the soul of the energy of the truth of your being.